Cougar has officially announced the partner of their 700M gaming mouse, and the keyboard that won the iF International Design Award – the Cougar 700K Aluminum Mechanical Gaming Keyboard. 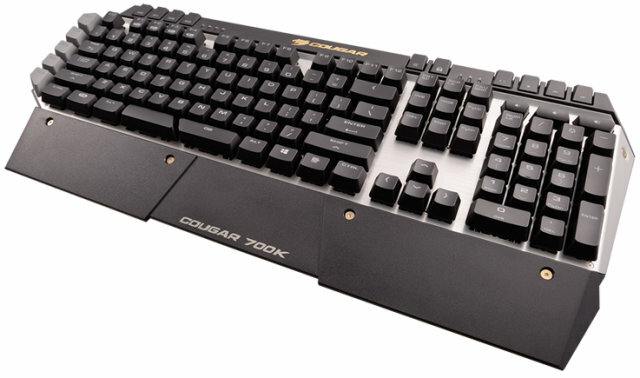 According to the company, they have invested two years on intense work in designing the Cougar 700K, making it one of the best (if not the best) gaming keyboard in the market. Check out more of its features, specifications, price and availability below. There’s also a introduction video of the 700K below for your reference. 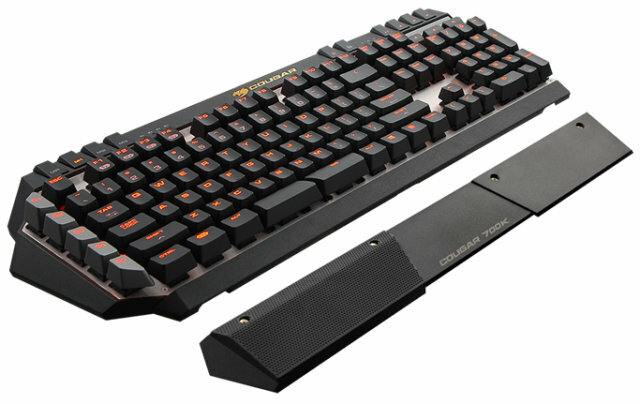 The Cougar 700K Gaming Keyboard is a premium mechanical gaming keyboard aimed at professional level PC gamers, especially those who engage in Massive Multiplayer Online Games (MMOs). It comes with COUGAR’s UIX System, a powerful software with a simple interface that combines your COUGAR peripherals (for example the new gaming mouse 700M) into a single application interface and allows you to conveniently configure all their functions. This way a single software can control all the peripherals, instead of needing, as most products on the market, an app for each device. The design of the Cougar 700K was inspired by stealth warship technology, and it is based on carefully selected geometrical shapes: mechanical key modules are mounted on an exposed aluminum structure with premium anodized surface treatments, and a plastic frame wraps its ends to create a stylish, sturdy and durable device. This, together with the wrist support points, makes possible a faster, more precise and comfortable keyboard experience. 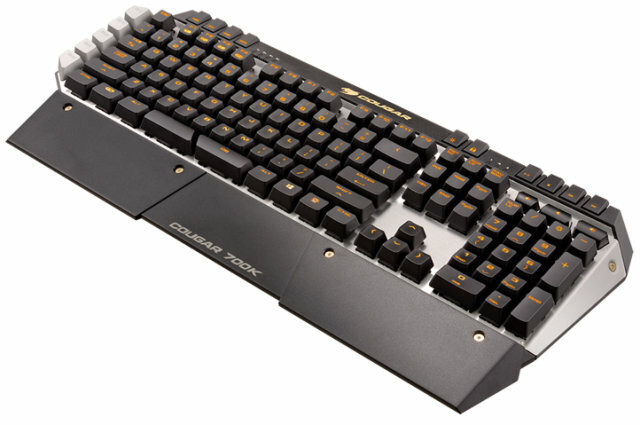 The 700k features German Cherry MX mechanical key switches that last up to 50 million keystrokes. 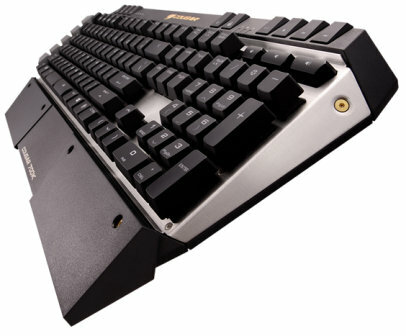 The mechanical keys deliver gaming-grade responsiveness and a distinctive tactile feedback. The COUGAR 700K keyboard is not just attractive on the outside, but also brings an impressive set of features for gaming and serious work, with a 32bit ARM processor in charge and on-board memory storage for up to 3 full configuration profiles. This allows you to bring your setup to other PCs without needing to re-configure the keyboard. With form & function come results. Looking pretty is one thing but actually being a good and usable device is another. The 700k has features that allow you to focus on speed or productivity such as full led backlights, giving individual keys a backlight setting which can be customized by choosing any single key to set the backlight on or off. In USB mode, the N-key rollover allows for use of any number of keys without needing a USB to PS/2 adapter. Normally, it is difficult to reach N-key rollover in USB mode but the 700k allows for unlimited simultaneous key presses, without missing any function. Also the user can choose the repeat rate of his preference: 1X, 2X, 4X or 8X. The keys are always ready for action, with the 1000HZ polling rate giving a 1ms response time. There are also 6 programmable G-keys, one for thumb use in an ergonomical position near the space bar and 5 silver buttons on the left side. Lastly, there is the FPS magnetic soft touch palm rest that provides great ergonomic support for WASD keys control. The union of a stylish and sturdy design, a wide range of well thought functions and the precision coming from its high quality components qualifies the 700K as the best gaming keyboard currently on the market. 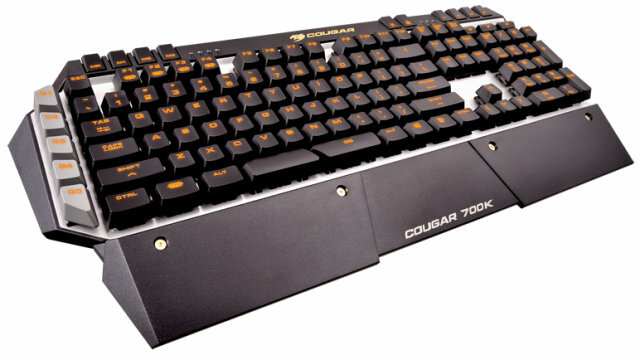 The Cougar 700K Aluminum Mechanical Gaming Keyboard (KBC700-1IS) with currently retails for $179.99 here. This is for the Cherry MX Red Switch model. I’m not sure if the price for the Cherry Black, Blue and Brown would be the same. Probably there will be slight price difference for the MX Brown and Black switches. Also note that retail price are subject to change, please visit the link for the updated price.